The Terry Leonard’s Stable’s Ponda’s Prospect is the current kingpin of Hawthorne’s Open Pace after a pair of dominating victories the last two weekends with driver Casey Leonard. The 4-year-old gelding is obviously in top form now and he’ll have to be to pass a tougher test in Friday night’s ninth race Open feature drawn by groups. Ponda’s Prospect has two more significant challenges to overcome in the $10,000 headliner: His assigned nine-slot and the arrival of a pair of east coast invaders. The 5-2 morning line favorite Ponda’s Prospect has five Hawthorne victories this season and they have all come from the one, two or three slots. He’s 0 for 7 in his outings from further out. However, he’s raced big in his last three starts since going on Lasix after prior losing seven straight Hawthorne races. Friday night’s new arrivals are Nitro Seelster (pp 3, Jim Lackey) and Rockin Wizard (pp 9, Ryan Anderson) and between them they have over $700,000 in career earnings and neither horse raced as a 2-year-old. In fact Nitro Seelster, a son of Camluck, didn’t make his first lifetime start until he was four when he was a seven time winner, banked almost $120,000. and took his mark of 1:49.4 at Pocono. Nitro Seelster, currently trained by Illinois Harness Hall of Fame horseman Doug Hamilton, was a 1:50 pacer the next year at The Meadowlands for Sandbur Farms (Demotte, Indiana) and Valarie Sutton (Marengo, Illinois) . This year the pacer has raced under the care of trainer Sarah Andrews in high conditioned races and preferred events at The Meadows in eastern Pennsylvania, winning a half-dozen times and a pacing a season mark of 1:51.1 on the five-eighths oval. Rockin Wizard, an eight-year-old son of Rocknroll Hanover, has been a steady money-maker on the east coast starting at the age of three. His best season came in 2015 as a 4-year-old when he raced out of the barn of trainer Virgil Moran, earning over $135,000 and pacing a career fastest time of 1:49 flat mile at The Meadowlands. Some familiar names will provide the opposition Friday evening for the programmed choice Ponda’s Prospect and new arrivals Rockin Wizard and Nitro Seelster. The first two posts will be manned by Hot Rod Dylan (Kyle Wilfong) and Rising To The Top (Cliff Bell). Slots four through seven will have Terror Of The Nite (Kyle Husted), Primo Giovanni (Travis Seekman), Sir Mammo (Ridge Warren) and Account Hanover (Juan Franco). Video replays for the Springfield and DuQuoin races are available here by clicking on the “Springfield-DuQuoin Replays” box on the right side of this website. The two-day harness racing meet at the u Du Quoin State Fair concluded Wednesday afternoon with stunning upset in the $25,000 Dudley Hanover stake for ICF 3-year-old male pacers. Springfield champion You’remyheartrob was bet down as the 4 to 5 favorite, but he turned out to be second best as 13-1 longshot Dandy Dude, capably driven by Ridge Warren, pulled off the major surprise with a career fastest 1:51.3 mile in the Dudley Hanover. Owned and trained by Dane May of Newton, Illinois, Warren hustled out Dandy Dune($29.40), away from the four-post and into a quick lead before yielding to You’remyhearthrob at the first quarter, timed in 27.3 into a strong headwind. 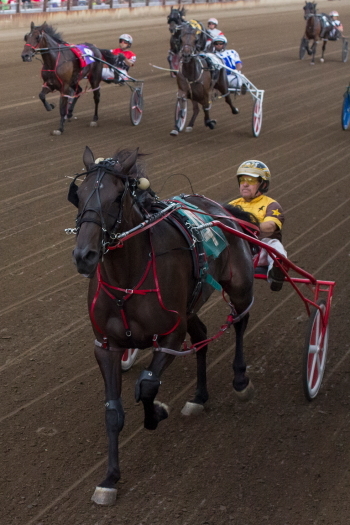 Ridge Warren steered Dandy Dune to his upset win in the Dudley Hanover. Earlier the Steve Searle Stable’s Louscardamon captured the $25,000 Darn Safe stake for ICF 2-year-old trotting colts and geldings, but his connections driver Mike Oosting had some anxious moments waiting out a long inquiry by the stewards before the Lous Legacy freshman was the declared the official winner. Louscardamon, who jettisoned himself out of contention at Springfield, when he went off stride in his elimination, made a break soon after the start of the Darn Safe stake. However, the freshman quickly went back trotting and was dropped into fifth without impeding any other horses. Louscardamon ($8.80) raced outside of leader Prince Cassis on the backstretch and despite taking a lot of air powered his way to the front and held off a late-charging Lousraptor at the end of his winning 1:59.2 mile. The victory was Louscardamon fourth in six freshman starts for the late-blooming 2-year-old owned by his breeders Flacco Family Farms of Alexis, Illinois. Mike Oosting was back in Victory Lane a race later, when the prohibitive 2 to 5 favorite Meyer On Fire, won for fun in the $25,000 Governor’s Cup for freshman pacing colts and geldings. Oosting was content to drop the Erv Miller youngster into fifth at the start while Mr P M (Cliff Bell), was pacing a 28.3 first quarter. Oosting had Meyer On Fire ($2.60), on the move soon after, getting alongside Mr P M at the 58 half and then drawing away with the Sagebrush youngster in the lane to triumph in 1:54.3. Meyer On Fire, also was a romping winner in the Springfield championships for ICF freshmen make pacers for the his owner and breeder Engel Stable of Buffalo Grove, Illinois. Just as he did at Springfield Fox Valley Reggie, proved to be best in the $7,000 championship for ICF pacing colts and geldings ages four and up. Kyle Wilfong again guided the Jamaica Patton trained gelding to another victory, the 4-year-old pacer’s eighth of 2018 for owners Ron Phillips (Athens, Illinois) and Sharry Boledovich of Lakewood, Colorado. Wilfong took Fox Valley Reggie ($6.40), out of the two-hole in the final turn, collared the pacesetting and eventual runner-up He Gone Jack (Casey Leonard), and won rather comfortably in 1:52 flat. Fox Valley Nemitz (Cliff Bell rallied to be third). One race later Gary Patterson’s Cowgirl Too (Casey Leonard), came up with a gutsy winning performance in the $7,000 aged pacing mare championship. Cowgirl Too ($11.40), raced without cover from the backside on outside of the leader Prettyfaceuglyways (Mike Oosting), but wasn’t going denied of her fifth victory as a 4-year-old, pulling away in the late to win in 1:55.2. Fox Valley Charliz (Jamaica Patton), nudged Prettyfaceuglyways for second. The abbreviated two-day harness racing meet at the Du Quoin State Fair comes to an end Wednesday but not before five more ICF championships are decided on an 11-race program that gets under at 11o’clock in the morning. 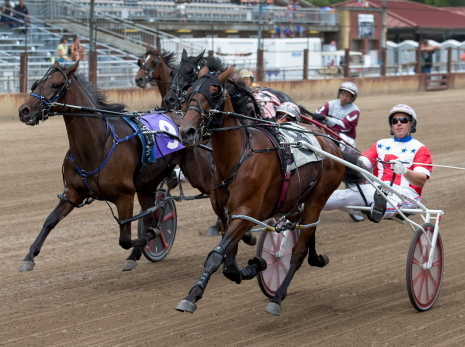 The $7,000 ICF pacing championships for older horses will go as races seven and eight with horses and geldings ages four and up going postward first. The seven horse field brings the first three Springfield championship finishers—Fox Valley Reggie, He Gone Jack and Fox Valley Nemitz in a seven-horse field. Looking to spring an upset are Cole Heat, Unimaginable and Dinky Dune. The eighth race will crown the Du Quoin State Fair filly and mare pacing titleholder and it will consist of Cowgirl Too, Fox Valley Charliz, Prettyfaceuglyways, Susan Sage and Powerful Intense. Four freshman trotters—Louscardamon (pp 5, Mike Oosting), Lousraptor (pp 6, Ronnie Gillespie), Trixie’s Turbo (pp 7, John D Finn) and Big Garcia (pp 8, Casey Leonard) will get the vast majority of the public’s support and they should. Ths quartet of freshmen between them have won 19 of 32 starts and most of the major state-bred stakes. Lousraptor flew down the lane at Springfield to take that championship in 1:56.4 and did it from the second tier, The Roshun Trigg juvenile previously had been racing on the County Fair circuit. Louscardamon has been tough to beat when he stays on stride. He didn’t in his Springfield elimination but did when he won its Consolation and a Kadabra leg earlier for trainer Steve Searle. Trixie’s Turbo, who can show gate speed, was second best at Springfield and the younger brother of Captain Greedy has never been worse than third in his six career starts for trainer Heather Stell. The freshman was a first leg winner of Hawthorne’s Kadabra stake series. Big Garcia Vega is another who can leave in a hurry and he stayed sharp with an easy victory Sunday night at Hawthorne. The youngster was third in the Springfield final for trainer Roshun Trigg. Meyer On Fire’s romping victory in this division’s Springfield Final along with the absence today of rival The Bucket has this Erv Miller trained sophomore at opening odds of 4 to 5. Mike Oosting is back at the son of Sagebrush’s lines. Mr P M, driven by his trainer Cliff Bell, was third at Springfield and looks like one of Meyer On Fire’s main threats. Another is Maximus (Kyle Wilfong) from the barn of trainer Kim Roth. Maximus did beat Meyer On Fire in their Incredible Finale series leg on July 21 but drawing the second tier (post 10) pretty much put a damper on the freshman’s chances in the Springfield Final. How fast of a first quarter will it take for a freshman in here to have command at the first quarter pole, probably a sub 27 first panel. That’s what it took in the Springfield showndown by You’remyheartrob when he left from the seven-post. Today he has the eight. Outside of the Brett Wilfong speedy two-year-old trainee who ended Fox Valley Gemini’s unbeaten streak at 16 in a row in their Springfield elimination and again beat him in the final with back to back 1:50.3 miles is Al’s Briefs (Travis Seekman), third in the championship. Springfield runner-up Backstreet Lawyer (Mike Oosting) is in the second tier (pp 10) behind the one-horse Song Cycle Senese (Kelcy Perymond), with No. 11 Sheriff Coffey outside. Can Backstreet Lawyer avoid traffic woes from his unfavorable post? A saving grace for The Tom Simmons trained freshman is that Song Cycle Senese can get away well and the pacer is sharp now. Fox Valley Gemini, winner of 16 of his first 18 races, did not make the journey to Du Quoin and instead is getting some well-deserved rest. First Day Wrap Up: Tuesday’s opening day Du Quin card was raced under sunny skies and hot temperatures (in the 90’s) with a strong stretch headwind of about 20 mph. In the first of five ICF $25,00 stakes for either 2 or 3-year-old the Springfield champ Fox Valley Halsey took advantage of a pocket trip from driver Casey Leonard and proved fastest in the lane for trainer Nelson Willis in the Director’s Award stake for ICF freshman filly pacers. The pace-setting Valar Morghulis (Juan Franco), another Willis trained filly, held on for second while Perch (Kyle Wilfong) came on for third in the 1:55.1 mile. Leonard was content to take the two-hole behind Valar Morghulis who took the field to a 56.1 half. Fox Valley Halsey found racing room in the stretch with the inside lane, zipped through nicely, and won by a half-length for the third time in nine careers start for Illinois owners Cynthia Kay Willis (Beecher) and Ronnie and Jerry Graham (Salem). Next up was the Shawnee for first season trotting fillies where E L Game On pulled off an upset victory for trainer Mike Rogers and owners Donald and Sherri Huddleston of Palmer, Illinois. The 7-1 winner was driver Kyle Wilfong’s fourth of the afternoon. Driver Mike Oosting did a masterful job of getting the 6-5 favorite Louzotic to the lead going into the first turn from the second tier by lining his trotter up behind No. 4 Puddin Cheeks but his filly’s quick 27.3 initial quarter proved to be costly in the lane. Puddin Cheeks got a two-hole trip through the 57.3 half while E L Game On came out from the middle of the pack to race first up. E L Game On ($15.80) kept grinding away, worn down a tiring Louzotic in the lane and put away a bid from runner-up Puddin Cheeks to pick-up her third season win in nine tries. Louzotic held on for third. Allbeastnobeauty (Mike Oosting) followed her Springfield championship with the Time Dancer title and she was all-out to hold off Party Belle (Travis Seekman) to do so in the 3-year-old filly pace event. Oosting had the prohibitive 1 to 2 favorite on the move on the backside where the Sportsmaster filly collared and passed the pacesetting The Sis Master at the 56.2 half and pulled away from the field by about six lengths. However Allbeastnobeauty started to shorten her stride in the stretch when the filly went in to a strong headwind and was just a neck better than Party Belle at the wire. It was the third consecutive win for Allbeastnobeauty and her owner’s trainer Mike Brink (Springfield, IL), Josh Cater (Williamsville, IL), Mark Brown (Chatham, IL) and Lawrence Crawford (Port Joe, FL). 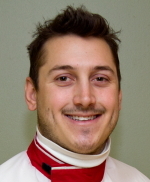 Driver Kyle Husted changed tactics in the Windy Skeeter with front-stepping Springfield victor Trotting Grace but the end result was the same, another championship for the 3-year-old trotting filly trained by Steve Searle. With the 8-slot in an 8-horse field Husted took Trotting Grace back at the start while stable-mate White Pants Fever grabbed the lead and trotted a 56.4 first half. Trotting Grace followed up cover, went three wide in the last turn and then drew off for owners Bill Wright (Morton, IL), Mystical Marker Farms (Valparaiso, IN) and trainer Steve Searle. The 2-1 second choice Maui Mama (Casey Leonard) was bottled up inside most of the race, doing well to shake loose in the stretch and put-close New Queen (Juan Franco) for second. The 3-year-old ICF colt and gelding trotters were next in the Pronto Don stake and it had three different horses have command before the first quarter (29.2) with Illinimight (Casey Leonard) eventually taking control. Majistic Caprice (Tyler Shehan) settled in second behind the Springfield champ Illinimight and later powered past in mid-stretch to prevail in 1:57.2. The Malabar Aqua sired winner is owned by Mississippians D & J Racing Stables (Terry) and trainer Roshun Trigg (Brandon) and now sports nine wins this year and 16 in less than two seasons of racing. Illinimight was second, almost two lengths behind, while True Detective (Curt Grummel) won the photo for third. 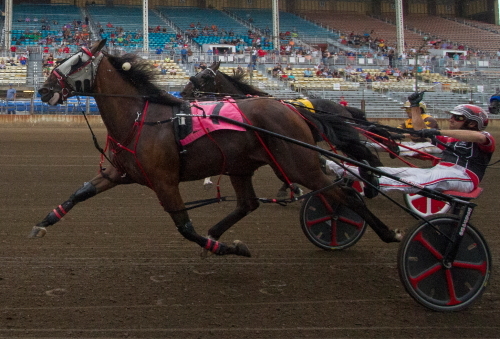 Anna’s Lucky Star (Kyle Wilfong) easily made it a sweep of the State Fair championships for ICF aged trotting mares. The Nelson Willis trained 4-year-old cruised to an eight length victory in 1:54.1 in the second non-wagering event. In the first non-betting race Picky Picky Valor (Casey Leonard) held off a fast closing Dr Spengler (Mike Oosting) by a slim nose in 1:55.4 to capture the $7,000 ICF championship for ICF male trotters, age four and up. 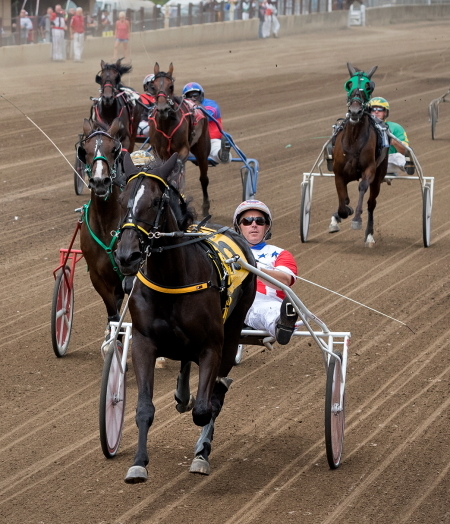 The two-day harness racing meet at the Du Quoin State Fair gets under way this morning with five ICF champions for either 2 or 3-year-olds to be decided plus a couple of early non-wagering events to determine its state-bred aged trotter champions. First post for the 10-race betting card is 11 am. You’ll have to show up earlier to watch six of the better ICF trotters, age four and up competing in non-betting events. A three horse field of aged male trotters consisting of Picky Picky Valor, Dr. Spengler and Springfield champion Primed N Powerful vie for a $7,000 purse at 10 am for the colt and gelding showdown. About a half hour later slugging it out for the mare trotting crown are Fox Valley Elana, Lous Game N Match and Anna’s Lucky Star, the latter is looking for a sweep of both State Fair crown. Fox Valley Halsey (pp 2, Casey Leonard) came up with her best effort in her first season of racing when she captured the Springfield in 1:53.2, a new career mark. She’s the 9-5 morning line favorite and deservedly so. The Sportsmaster filly is never been worse than third in eight lifetime starts for trainer Nelson Willis. Brienne The Beauty (Travis Seekman) looked very good winning her first two career stars, including a leg of Hawthorne’s Incredible Tillie but disappointed at Springfield. Perhaps she had some health issues or maybe that all dirt racing surface didn’t suit her. If she’s right she’s a major threat. Perch (Kyle Wilfong) is a filly that starts slow and finishes fast. She was too far back at Springfield when she closed in a big way for second. The Duneside Perch filly drew the outside eight-post and that is a concern. Fox Valley Little Kim is coming along nicely. A more favorable trip than she had at Springfield gives the filly a big shot with her new driver mike Oosting. The two programs favorites, Louzotic (5-2, Mike Oosting) and Loussolataire (7-2, Kyle Husted), landed the outside 10 and 9 slots, respectively, maybe making this stake ripe for an upset winner. Puddin Cheeks (John D Finn) had a big try at Springfield from the 9-slot and should relish the move to the four-post where she may seek command. Heidi High (Chares Arthur) is another who can get away from the gate in a hurry and Ivana (Casey Leonard) also showed gate speed at Springfield. Louzotic was second best at Springfield but the winner Encantado not making the trip to Du Quoin, this Steve Searle trained filly rates as the trotter too beat despite her post. She has enough speed from the gate to maybe find an early hole. It appears Allbeastnobeauty (Mike Oosting) has gotten good again at the right time for the Mike Brink stable. The Sportsmaster filly dug in nicely to take the Springfield championship and there’s leg of the Plum Peachy and its $85,000 (est) final on the horizon. Allbeastnobeauty had a tough trip when she beat Fox Valley Jazzy by a neck at Springfield and that filly has skipped Du Quoin. The third place Springfield finisher Rollin Coal is back for another try at the division leader and her five length defeat could be a bit deceiving. The Hosea Williams filly was taken back at the start and was never in position to contend. That should change this afternoon. The Sis Master (Michele Morgan) figures to shoot out and likely will have command. Trained by her driver, the Sportsmaster raced subpar at Springfield but could be a lot better today. Skeeter Machine (Kyle Wilfong) has been best up close and she wasn’t there in either of her Springfield races. With the drawn not going the way of the top three finishers of the Springfield Final there should be a lot of early action in this stake as drivers try to get their trotters in good position. Springfield champ Trotting Grace (Kyle Husted) drew the outside eight-slot nevertheless she’s in peak form and the Cassis filly did breeze in both Springfield outings for trainer Steve Searle. White Pants Fever (pp 6, Ridge Warren) was second best two weeks ago and while she hasn’t been able to beat her stable-mate Trotting Grace as a 3-yerar-old she is a threat to do so. An outside post (pp 7,) is nothing new for Maui Mana and her driver Casey Leonard. They had the seven at Springfield and the eight in the last Dygert leg. The Mike Brink trainee left in her last two starts and likely will be sprinting out today. The daughter of Cassis is seeking career win No. 10 in 18 trips to the gate. Illinimight’s turnaround at Springfield along with today’s draw has made this an intriguing championship. Big Lou (Kyle Wilfong) has shown he has the best late rush in the field but he did land the nine-hole and probably will have a lot of horses to try and pass up for trainer Curt Grummel. No surprise if he does just that today. Springfield’s beaten favorite Majistic Caprice moves from the eight-post to the five for his new driver Tyler Shehan and that should bode well for the Malabar Aqua gelding. The Roshun Trigg trainee was parked out to a quick 27.3 first quarter at Springfield. Don’t Ne Cheeky (Ronnie Gillespie) with the rail will see to it that Majistic Caprice doesn’t make the top with ease, Another Roshun Trigg starter, Don’t Be Cheeky went off stride in the lane at Springfield after a solid effort in his elimination. Illinimight (Casey Leonard) came out on top in last year’s Incredible Finale Final and may be getting sharp when it counts the most. His 1:54.4 win at Springfield shows the Mike Brink trotter can be a major player in today’s Pronto Don and for another Night of Champions victory. True Detective is a price shot to consider. This year’s Cardinal champion had the misfortune to draw the 10-slot in the second tier in both Springfield starts. The Lous Legacy gelding has been best up close and could motor out from the two-slot and race near the front today for trainer-driver Curt Grummel. 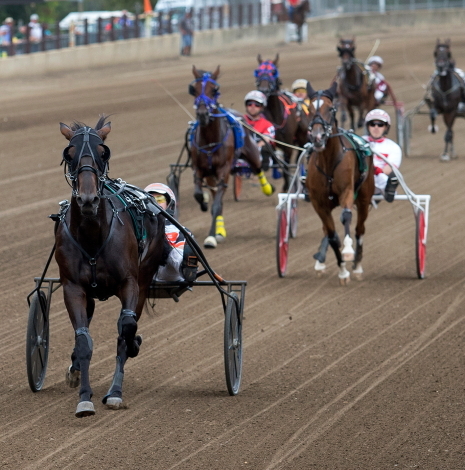 The fields have been drawn for the upcoming two-day Du Quoin State Fair harness racing meet. Five ICF championships will be decided on Tuesday’s opening day card with an 11 am first post and three more will be contested on the Wednesday program also beginning at 11 am. The Wednesday card had been originally scheduled for a 6:30 pm. start but was moved up because of a threat of rain. Tuesday’s Illinois bred stake races, all with $25,000 purses, will go as the last five races on the card starting with the sixth race Director’s Award for 2-year-old pacing fillies. Here’s how the Director’s Award eight-horse field will line up: Valar Morghulis, Springfield champion Fox Valley Halsey, Brienne The Beauty, Winter Gram, Caroline GR, Fox Valley Lil Kim, Foolishlittlegirl and Perch. The Shawnee for freshman filly trotters follows. From post one through ten you’ll find Skippmalou, Ours Is Victory, Ivanka, Puddin Cheeks, E L Game On, Lou’s Paramour, Heidi, Notanangel, Loussolatare and Louzotic from the furthest outside slot. The Time Dancer for sophomore pacing fillies is next up. From the rail its Sandy Sage, Skeeter Machine, The Sister Master, The New Americana, Springfield victor Allbeastnobeauty, Party Belle, Isaac’s Ideal and Rollin Coal. The Winter Skeeter has eight sophomore filly trotters with Springfield champion Trotting Grace landing the outside eight-slot. Inside of the Steve Searle trained filly are J Cougar, Shadow Copy, Sunny Sasha, Powerful Temtrist, New Queen, White Pants Fever and Maui Mama. The Pronto Don stake for 3-year-old state-bred male trotters concludes the Tuesday program and it’ll have a full field of 10 horses going to the starting gate: Don’t Be Cheeky, True Detective, Fly The W, Cruzen Cassi, Majistic Caprice, Illinimight, who captured the Springfield final, along with Talk About Valor, Fox Valley Strpwr and Big Lou, in that order. Wednesday’s three ICF championships are the final events on that card, and again all with $25,000 pots.. First comes the eighth race Darn Safe stake and 10 juvenile trotters will line up behind the starting gate. Posts one through ten will be manned by Captainblacksparow, Swaneelou, Princess Cassis, Super Betcha, Louscardamon, Springfield State Fair victor Lousraptor, along Trixie’s Turbo, Big Garcia Vega, Crackerjack Bill and For Trots Sake. Springfield winner Meyer On Fire (pp 4) takes on seven freshman pacing colt rivals in the Governor’s Cup with Holden Steady, Coming Ip and Frontier Muffler starting inside of him and Fox Valley Julius, Mr P M, Maximus and Cooter Luke on his right. The ICF glamour division is the Dundley Hanover for 3-year-old pacing colts and geldings and the draw didn’t go well for the three likely favorites—Springfield conqueror You’remyheartrob, third place finisher Al’s Brief’s, and runner-up Backstreet Lawyer with posts 8, 9 and 10 respectively. Stay-At-Home Freshmen: Some of the ICF 2-year-olds who won’t be making the trip to Du Quoin are racing Sunday night including The Bucket in race three. The Terry Leonard trained freshman was upset in the Springfield Final by Meyer on Fire, snapping a four-race winning streak. The Sagebrush freshman is 5-for-7 in his career with a win and a second in the Incredible Finale stake series. Among the first season state-bred pacers also staying sharp on their home track in race nine are the fillies Fox Valley Lolo, Lilly Von Shtopp, Fox Valley Torrid and Yankee Joanie. The latter won an Incredible Tillie leg and was second in another for trainer Herman Wheeler. On the other hand in Sunday night’s sixth race 2-year-old trot features three Springfield finalists—Big Garcia Vega, Heidi High, and Crackerjack Bill—who are making the journey to the State Fair in Southern Illinois for Wednesday night’s $25,000 Darn Safe trotting stake. Can “Bobette” Prevail Where Others Failed? Bucklegirl Bobette, the reigning queen of Hawthorne, will attempt Saturday night to prevail where the last three horses have failed . . . finish first from the assigned 10-hole in a six horse field. A week ago Bucklegirl Bobette extended her winning streak at Hawthorne to six in a row with another easy filly and mare Open Pace triumph for trainer Rob Rittoff. The latest was a 1:52 flat mile for tonight’s driver Travis Seekman. Earlier in the meet the 5-year-old Duneside Perch mare posted back-to-back Open triumphs with 1:50.3 miles. Last Sunday the trotter Walter White was the latest horse at the meet to come up short from an allocated 10-slot in a six-horse field. Trotters Anna’s Lucky Star and Picky Picky Valor also saw winning streaks end earlier from the same post designated by the Race Office. However, the fete has been accomplished at this summer’s meet. 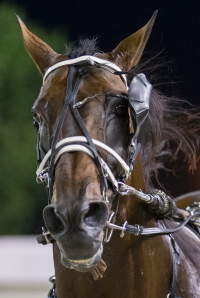 Back on June 8th the Terry Leonard Stable’s Trashytonguetalker (Casey Leonard) overcame the assigned 10 slot in his winning 1:52 mile, his third consecutive Open victory. The pacer also rattled off a four race winning streak at Hawthorne’s winter meet. Starting inside of Bucklegirl Bobette in Saturday’s co-featured $10,000 third race is Lady’s Party (Ridge Warren), Phyliis Jean (Juan Franco), Char N Marg (Casey Leonard), Sweetshadyshark (Robert Smolin), Town Temptress (Kyle Husted) and Boogie On Down (Kyle Wilfong), in that order. Town Temptress breezed in her last start for trainer Kelly Chupp however that 1:53 flat Open victory came almost a month ago (July 21). 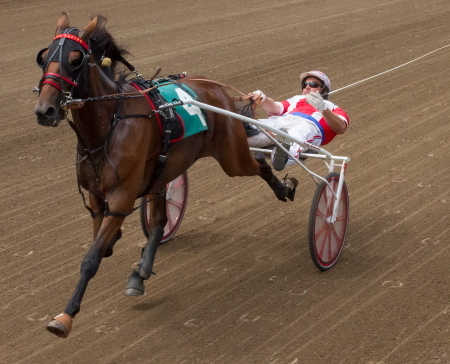 Last year the Artsplace mare took her lifetime mark of 1:51.3 at Scioto Downs in Ohio at the age of five. Fast Invader: Two races later is the $10,000 Open Pace for “the boys” and coming to town is the Payton Ode trained 5-year-old A Bettors Risk fresh off a sparkling 1:48.2 conquest at Hoosier Park. Ponda’s Prospect looks to be back at the top of his game after a convincing 1:51 flat Open triumph a week ago for the Terry Leonard stable, a career fastest mile for the 4-year-old Shadyshark Hanover gelding. Ponda’s Prospect is listed as the 2-1 morning line favorite with a Bettors Risk next at 5-2. The Jim Eaton stable’s star 2-year-old filly trotter Encantado, the impressive 1:54.2 winner in the $27,500 Springfield Final for 2-year-old trotting fillies is expected to skip Tuesday’s Windy Skeeter freshman stake at the Du Quoin State Fair. With Encantado’s Springfield championship coming on the 15th (of August), it also would be five big races in five and a half weeks if she went to Du Quoin. That’s a lot to ask a 2-year-old filly in the middle of summer. “By not sending her she’ll get a good rest before her two legs of the Fox Valley Flan at Hawthorne and the Final,” added the Michigan native. Eaton likes what he saw when he spotted Encanatado at her yearling sale, nevertheless so far, the filly has even exceeded her trainer’s expectations. The daughter of Lous Legacy, out of the Broadway Hall broodmare Lime Sunlight has risen to the top of her ICF division. Thus far Encantado has only one blemish on her first season of racing and that was her runner-up finish in a second leg of the Fox Valley Flan stake series behind the winner Louzotic. Encantado avenged that defeat at Springfield, beating her rival by a comfortable two and one-half lengths with Casey Leonard at her lines. The filly began her career with a victory on the division of the $30,050 Violet and followed with a win in her initial Fox Valley Flan leg at Hawthorne. After her July 22nd Fox Valley Flan loss, she rebounded with an easy win in her Springfield elimination, before cruising in the final. Encantado has earned $40,150 in her first five lifetime starts for Illinois owners Phil Langley (Frankfort), Jim Schwarz (Wooddale) and Eaton (Crete). It’s Official: The Friday night feature at Hawthorne is the ninth high-level conditioned pace. The $8,000 event is for non-winners of $6,500 in their last five starts and a number of the nine pacers going to the gate are former Open Pace starters at the summer meet. The 5-2 program favorite is Parklane Official (Casey Leonard), from the barn of trainer Nelson Willis. The 3-year-old Art Official gelding was put on Lasix three starts ago and proceeded to win in 1:51.4, a new lifetime mark and was beaten less than one length in a Hawthorne Open in his next outing. Fox Valley Reggie, Lyons King, Sunset Dreamer, Last Dragon, Rising To The Top, Hash-Tag Swag, Buff’s Image and Jewel Maker will provide the competition. Fox Valley Reggie (Kyle Wilfong), spent the month of July racing in Hawthorne Opens before heading to Springfield, where he captured the Illinois State Fair Colt Stakes championship for aged male pacers in 1:51.2, a career fastest mile for the 4-year-old ICF pacer. A reminder: Entries for Du Quoin’s two-day meeting (next Tuesday and Wednesday), will be taken Saturday morning at the Hawthorne Race Office (708-780-3690). Tuesday’s Du Quoin card has an 11am first post, while the Wednesday program gets under way at 6:30 in the evening. 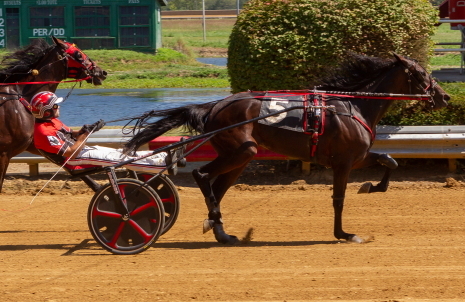 After a successful Springfield State Fair meeting behind him, veteran trainer Steve Searle has his talented young trotters pointed to Du Quoin State Fair. The brief two-day meet is next Tuesday afternoon and Wednesday evening. It’s a long five hour drive from Searle’s farm in Grant Park, Illinois to the Du Quoin Fairgrounds, but it could be a rewarding trip for Steve and his owners after the 59- year-old Wisconsin native finished second behind Mike Brink in the trainer standings at Springfield. Trotting Grace has over $40,000 on her card this year, while White Pants Fever has done even better with $46,819 banked this season. After Tuesday’s Windy Skeeter stake at Du Quoin both fillies have a $12,500 leg of Hawthorne’s Beulah Dygert Memorial stake and its $85,000 (est) final on the September 22nd Night of Champions still on their schedule. Steve is also bringing down his “special” freshman trotting filly Louzotic down to Du Quoin. The daughter of Louis Legacy had a big effort when she was second best behind Encantado in the $27,500 Springfield division final. Louzotic captured a leg of Hawthorne’s Fox Valley Flan stake series in her prior July start and currently sports a plush record of 4 wins and 2 seconds in 7 career trips to the starting gate with just under $25,000 in earnings and two more $12,500 legs Fox Valley Flan series legs and its $75.00 (est) championship to be raced in September. 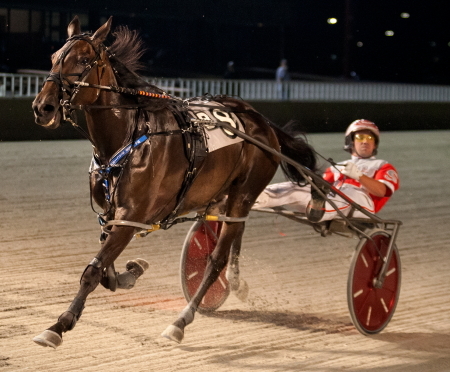 Searle will also send out the 2-year-old colt trotter Louscardamon in Wednesday’s Darn Safe stake. The Lous Legacy youngster is very green, but has the potential to be a good trotter for Searle and owners Flacco Family Farms and Dr. Patrick Graham. Staying on stride for the entire mile kept Louscardamon at a shot in the $25,000 Springfield Final and instead the colt had to settle for that stake’s Consolation prize ($7,000 purse) last week. Louscardamon breezed in his Kadabra leg at Hawthorne in his first pari-mutuel start and led the field coming out of the last turn in his Springfield elimination when he started running with driver Mike Oosting as the public’s choice. The youngster, also went off-stride in his first two career starts on the County Fair Circuit, but was still much the best in his debut at Carrollton. Tuesday’s opening day post time is 11 am, while Wednesday’s card will get under way at 6:30 in the evening. Du Quoin Draws Info: A double draw for both Du Quoins cards is set for this Saturday morning at Hawthorne. Entries close at 10 am. The ICF stake championships for 2 and 3-year-olds all carry at $200 entry fee.